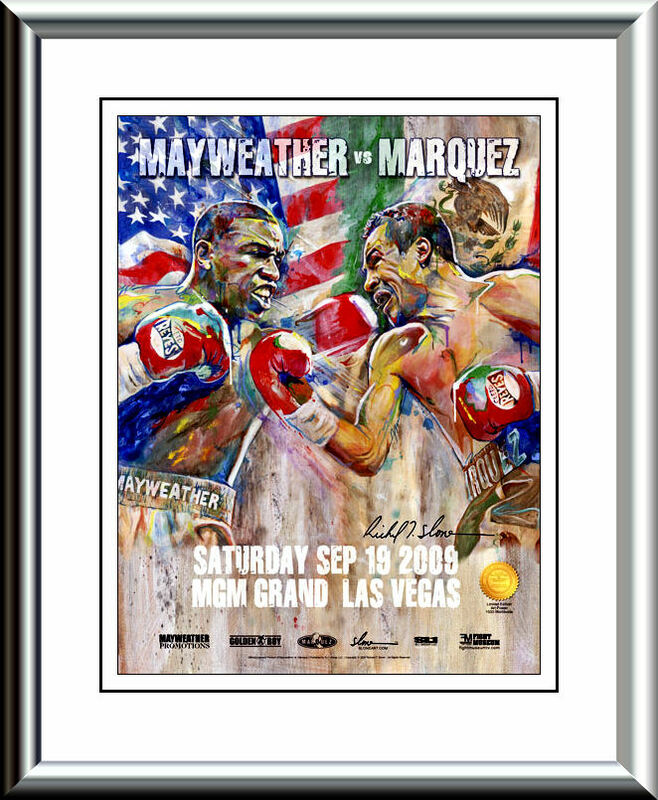 Description : Official Slone art limited edition MGM Grand commissioned onsite poster from the Mega Fight at the MGM Grand Garden Arena in Las Vegas. On May 2, 2009, it was confirmed that Mayweather was coming out of a 21 month retirement to fight The Ring lightweight champion and #2 pound 4 pound Juan Manuel Marquez, at a catch weight of 144 lb on July 18 at the MGM Grand in Las Vegas The fight was postponed due to a rib injury Mayweather received during training. HBO's sports series 24/7 was also rescheduled for August 29. The fight took place on September 19 in conjunction with Mexican Independence Day, traditionally a big boxing weekend. During the official weigh-in for their 142 lb bout, Mayweather failed to meet the weight limit at 146 lb and was fined as a result. However, it was later revealed that the contract was changed so that Mayweather could make weight within the welterweight limit of 140-147 lb as long as Marquez received a large guarantee. Mayweather won a unanimous decision after 12 rounds in a lopsided fight, Marquez landed 12 percent of his total 583 punches, while Mayweather landed 59 percent of his 490 total punches; judges scorecards read 120-107, 119-108 and 118-109.